On behalf of the Chancellor Selection Committee and the Board of Trustees, I am pleased to announce that the Board has identified Dr. Jowel C. Laguerre as the leading candidate for the position of Chancellor of our District. 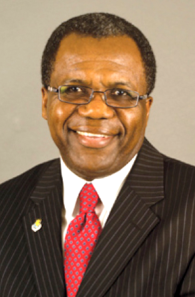 Dr. Laguerre is the Superintendent-President of Solano Community College District. Attached is Dr. Laguerre’s background and accomplishments. We very much appreciate the commitment and dedication of the Selection Committee and Dr. Fran White, our Search Consultant from Community College Search Services, in identifying qualified finalists. The Selection Committee members conducted their work under a tight recruitment and selection timeline, which allows the Board to keep the selection process on schedule. The next step in the process is for the Board members to conduct a site visit to Solano Community College District. The site visit will include Trustees, as well as managers, faculty, classified staff and students. The President of the District Academic Senate (or designee) and the President of the Peralta Federation of Teachers (or designee) are also invited to participate in the site visit. Arrangements for the site visit, which is anticipated to occur no later than the week of June 8, 2015, is underway and will be announced once finalized.